The anonymous source gave proofs going from a clear blog post date 10th January 2009 to a PGP key Satoshi required people from the project to use, passing through his ex-wife claim that he was working on “digital money”, his use of email satoshi@vistomail.com, an address used in early development Stages by Satoshi Nakamoto, and his activity in lobbying in the Australian Taxation Office in regards to a new technology. 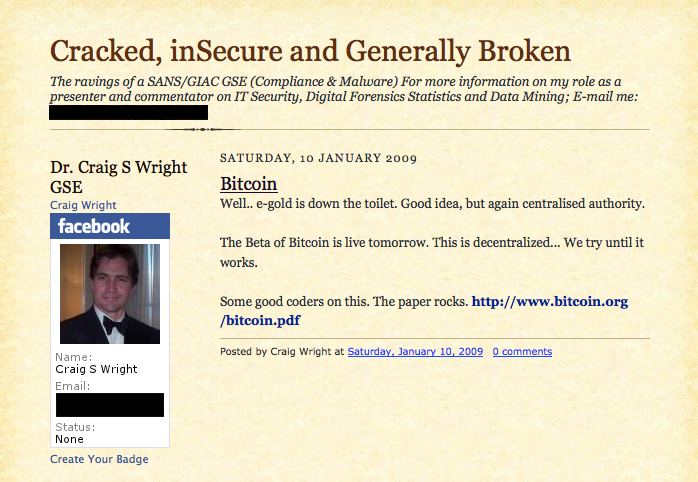 This day is leaving us with some questions, the most banal one: is Craig Steven Wright really Satoshi Nakamoto? But there’s still plenty to think about: if he is, why did he prefer to disappear from the scene? Was he scared by what he created and the possible consequences of being identified? Whatever the answers, seeing the recent police raid into his house, and his stance toward taxation, there are good chances we will soon know the truth: if Craig is Satoshi, a part of the million of Bitcoins on the Satoshi account is going to be converted into FIAT currency… to pay the fines. The search for Satoshi Nakamoto has been going on for at least five years now, but the quest is now probably over, after new evidence including blog posts, emails and accounting statements, has been leaked by an anonymous source to tech websites Gizmodo and Wired . The truth is probably less exotic than we imagined, as the inventor of Bitcoin is far from being a secluded, unsuccessful physician/engineer of japanese origins , but a much more ordinary Australian business man. Next PostCould this Australian be the creator of Bitcoin?